Scientists working in Madagascar have found what may be the largest frog that ever lived—and it had an attitude to match, experts say. A frog the size of a bowling ball, with heavy armor and teeth, lived among dinosaurs millions of years ago — intimidating enough that scientists who unearthed its fossils dubbed the beast Beelzebufo, or Devil Toad. But its size — 10 pounds and 16 inches long — isn’t the only curiosity. Researchers discovered the creature’s bones in Madagascar. Yet it seems to be a close relative of normal-sized frogs who today live half a world away in South America, challenging assumptions about ancient geography. The discovery, led by paleontologist David Krause at New York’s Stony Brook University, was published Monday by the journal Proceedings of the National Academy of Sciences. Krause began finding fragments of abnormally large frog bones in Madagascar, off the coast of Africa, in 1993. They dated back to the late Cretaceous period, roughly 70 million years ago, in an area where Krause also was finding dinosaur and crocodile fossils. But only recently did Krause’s team assemble enough frog bones to piece together what the creature would have looked like, and weighed. The largest living frog, the Goliath frog of West Africa, can reach 7 pounds. But Krause teamed with fossil frog experts from University College London to determine that Beelzebufo isn’t related to other African frogs. It seems to be a relative of South American horned frogs, known scientifically as Ceratophrys. Popular as pets, they’re sometimes called pacman frogs for their huge mouths. Like those modern frogs, Beelzebufo had a wide mouth and powerful jaws, plus teeth. Skull bones were extremely thick, with ridges and grooves characteristic of some type of armor or protective shield. The name comes from the Greek word for devil, Beelzebub, and Latin for toad, bufo (pronounced boo-foe). The family link raises a paleontology puzzle: Standard theory for how the continents drifted apart show what is now Madagascar would have been long separated by ocean from South America during Beelzebufo’s time. And frogs can’t survive long in salt water, Krause noted. He contends the giant frog provides evidence for competing theories that some bridge still connected the land masses that late in time, perhaps via an Antarctica that was much warmer than today. 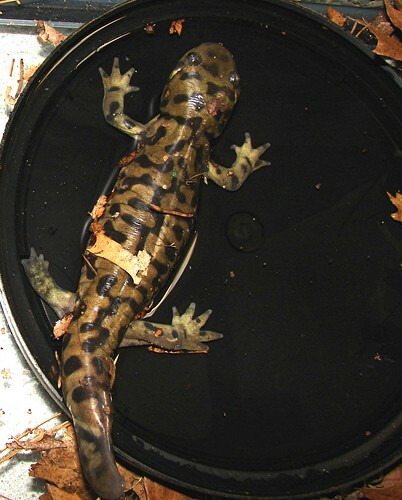 Salamander update February 16, 2008, originally uploaded by EcoSnake. The little salamander’s leg and tail continue to grow. The left leg is now almost as long as the right leg, though slightly thinner. Click on the picture to view previous pictures of this remarkable progress. The two-legged meat-eaters, discovered recently in the Sahara, had teeth and feasting techniques similar to those of modern-day predators, a new study says. News from National Geographic. Laws protecting the critically endangered Sumatran Tiger have failed to prevent tiger body parts being offered on open sale in Indonesia, according to a new TRAFFIC report. Tiger body parts, including canine teeth, claws, skin pieces, whiskers and bones, were on sale in 10 percent of the 326 retail outlets surveyed during 2006 in 28 cities and towns across Sumatra. Outlets included goldsmiths, souvenir and traditional Chinese medicine shops, and shops selling antique and precious stones. Herpetological Symposium will be held this summer in Nashville, Tennessee. call Ken at (702) 203-0983.
conservation, and/or educational work with reptiles and amphibians. Narrow-headed Garter Snake (Thamnophis rufipunctatus). Posted by Frank - February 12, 2008 and a personal note: I’m proud to be Secretary and a Member of the Board of Directors of the International Herpetological Symposium. For over thirty years it has been an unique forum for all who share interests in herpetology: Biologists, Zoo professionals, Captive herp breeders, Conservationists, Hobbyists and Everyone else who share our love and concern for these wonderful creatures who have helped shape our earth for so many millions of years. Please consider attending and participating in this year’s symposium in Nashville. You will learn a lot and also have fun! Tuatara poster from New Zealand, originally uploaded by EcoSnake. Please see story below. This poster from a couple of years ago when New Zealand was issuing new coins illustrates what should be the world’s commitment to preserving and protecting the tuatara who have been on our earth over 225 million years. Two young tuatara hatched at Wellington’s Victoria University and raised at Auckland Zoo are today being released back to their ancestral island home in a bid to boost the population of the rare native species. The pair of four-year-old Northern tuatara are the first to be released on to Cuvier Island in Hauraki Gulf since 2003, bringing the population to almost 30. 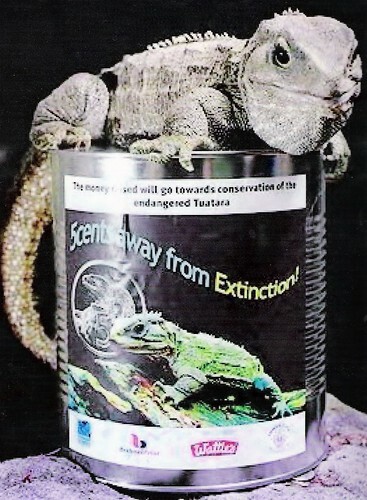 Six adult tuatara were taken from the island by Conservation Department officials in 1990 during a rat eradication programme, and a breeding recovery programme started at Auckland Zoo. Once laid, the eggs are taken to Victoria University in Wellington to be hatched, then are returned to the zoo when they are a few months old. Auckland Zoo fauna team leader Andrew Nelson said incubating the eggs allowed the university to carry out research into the influence of temperature on tuatara gender, as well as the effects of global warming. As tuatara do not reach sexual maturity till they are about 14 - and often do not start breeding till they are much older - the breeding recovery programme was slow, he said. A total of 20 young tuatara have now been released back on to the island, with a further 14 expected to return next spring, providing they reach the target 80 grams in weight. A further four tuatara eggs from a clutch laid at the zoo in December are currently incubating at Victoria University. While only six adults could be found on the island before the rat eradication programme, a further seven adults had since been located, bringing the total to an estimated 27. Tuatara are found only in New Zealand and is the only surviving member of the sphenodonitia, a lineage that stretches back to the dinosaur age some 225 million years ago. While no one knows for certain how long tuatara can live, the oldest living tuatara, Henry, was born in the 1880s and is over 120 years old. Henry now lives at the Southland Museum in Invercargill.